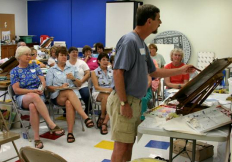 The artists of the Arts Center of Yates County include painters, photographers, clay artists and potters, jewelry makers, wood and metal workers, sculptors and artists in many other media. They are part of a vibrant, active community of creative people who enjoy the beauty and inspiration of our Finger Lakes region. Works by our artists, as well as guest artists, are on display and for sale at the Flick Gallery in the Arts Center in Penn Yan, N.Y. Exhibits change almost every month. New art and new creations are always there to enjoy. Our artists also give educational workshops and demonstrations in a variety of media. Our workshops are open to anyone who enjoys creating, from beginner to master. If you are an artist and would like to become an ACYC instructor please complete the Workshop Proposal form. Information about the ACYC Artist Residency at Sunny Point can be found here. Mouse over the thumbnails below to identify the artist. Click on an image to see more images of the artist's work.